Bob Arum’s Top Rank Boxing on ESPN+ featured two heavy hitters Friday in the heavyweight division at Turning Stone Resort & Casino, in Verona, NY, as Philadelphia’s Bryant “By-By” Jennings was upset in a close fight in the twelfth and final round by 2008 Olympian Colombian Oscar “Kaboom” Rivas. This bout waa for Jennings IBF International and the WBO NABO heavyweight titles. In the Main Event Philadelphia’s Bryant “By-By” Jennings, 24-3 (14), was defeated by NABF champion Colombian Oscar “Kaboom” Rivas, 26-0 (18), out of Montreal, CAN, at 0:54 of the twelfth and final round. In the first round it was Rivas coming forward with Jennings landing his jab. In the opening round Rivas landed a combination to the head of Jennings. Jennings countered with a left hook to the body of Rivas. Rivas with hands held high to block the jabs of Jennings who is much faster with hands and feet and an 84” reach. In the second round it was Jennings with hands held high and Rivas still coming forward going to the body. Both fighters exchanged left hooks to the head. Rivas landed a solid left hook to the body of Jennings. Rivas drove Jennings against the ropes with body shots. Rivas landed a hard left hook to the chin of Jennings at the bell. In the third round Rivas came out throwing punches with determination to hurt Jennings. He landed a lead right between the gloves of Jennings. Jennings used his reach with a jab but not much coming from his right hand. In the fourth round Jennings came out with more behind his jab. Rivas landed a right uppercut to the chin of Jennings. Rivas put Jennings up against the ropes with combinations. Jennings hasn’t shown anything more than a jab so far. In the fifth round Rivas immediately went to the body. Jennings landed more punches with his jab but Rivas landed the power punches. Jennings kept moving using his jab and an occasional left hook to the body. In the sixth round Jennings finally opened up in the middle of the ring landing jabs and several rights to the chin of Rivas. Jennings landed a good left hook to the head of Rivas. Jennings led with a left hook followed by a right to the chin of Rivas. The movement of Jennings seemed to bother Rivas. In the seventh round Rivas landed a triple jab with Jennings countering with a right to the chin. Rivas landed an overhand right to the chin of Jennings. Jennings came back with an overhand right to the head of his own. In the last 10 seconds of the round though pinned against the ropes it was Jennings landing punches. In the eighth round Jennings landed five unanswered punches to the body and head of Rivas. Jennings was walking Rivas back until Rivas landed a right to the chin. Rivas landed a lead right to the body of Jennings. Jennings began to chase Rivas who seemed to be slowing down. In the ninth round Rivas used his jab until a left hook from Jennings landed on his jaw. Rivas landed several punches to the body and head of Jennings. Both had their best exchange of the fight up to this point. It was a close round in a close fight. In the tenth round Rivas landed a 3-punch combination driving Jennings against the ropes. Rivas landed a straight right through the gloves of Jennings on the chin. In the eleventh round Jennings landed a double left hook to the body and head of Rivas. Rivas got a warning from referee Gary Rosato about hitting behind the head. Rivas landed a solid overhand right to the jead of Jennings who came back with a right of his own. 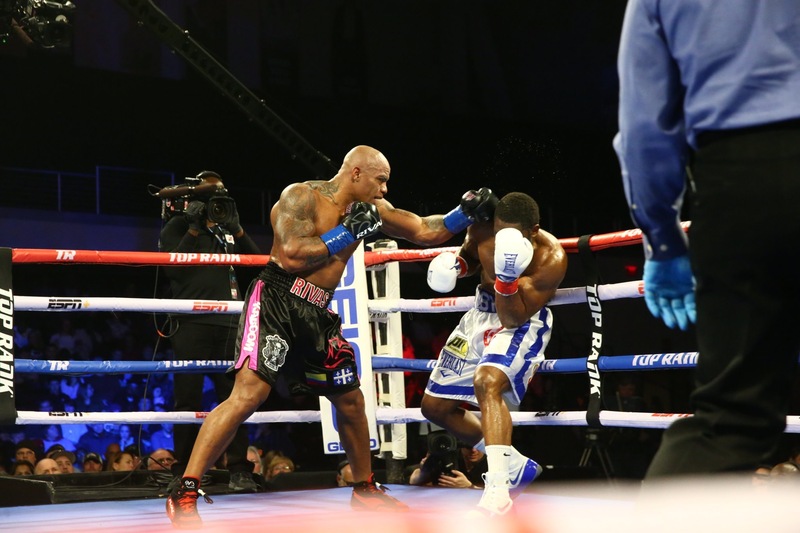 In the twelfth and final round Rivas came out with a flurry of punches dropping Jennings. Rivas went on the attack having Jennings defenseless against the ropes with referee Rosato wisely stopping it. This writer had it 6-5 in rounds for Rivas going into the last round. Two of the scorecards had it for Rivas. “In the twelfth and final round my trainer Marc Ramsey told me how hard I worked in training running up the mountain. I figured out I needed the left hook to end this fight,” said Rivas. “I’m a whole man now. Of course I’m disappointed. It is what it is,” said Jennings. In the co-feature 21 year-old 2016 Olympic Silver Medalist No. 11 ranked IBF Super Featherweight southpaw Shakur “Fearless” Stevenson, 10-0 (6), out of Brick City, Newark, NJ, looked sensational stopping Jesse “Jimdomar” Cris “VIP” Morales, 22-2-1 (10), of Cebu City, in the Philippines, at 1:29 of the fourth round winning the vacant IBF Inter-Continental and vacant WBC Continental Americas featherweight titles. In the first round Morales came forward with Stevenson using his jab. Stevenson lands a combination to the head of Morales. Stevenson lands a 3-punch combination to the head of Morales. Stevenson landed a flurry of punches without return. Morales hardly landed a punch thru the round. In the second round dedicating this fight to his cousin who passed away recently Stevenson is all business. Morales came forward walking into punch after punch. There was blood on the hair line of Morales. Stevenson has been punching at will. Morales has had some success going to the body but nothing to the head. In the third round Stevenson drives Morales to the ropes with head punches. Morales had nothing to come back with. A left uppercut to the body hurt Morales. Morales came back with a right to the body. In the fourth round Morales comes out landed a right to the chin of Stevenson bringing a smile from the Olympian. Both fighters are going to the body as Stevenson drives Morales into the ropes and drops him with a left uppercut followed by a straight left to the chin. Referee Charlie Fitch gave him the 8 count but Morales was in no condition to continue as the fight is waved off as it should have been. “I’m on the right track listening to my corner (grandfather). I want to go to the English side and fight there and fight Josh Warrington, 28-0 (6), for his IBF title,” said Stevenson. His promoter Bob Arum agreed. Super Welterweight Dominican Carlos Adames, 16-0 (13), out of Washington Heights, NY, knocked out Venezuela’s Juan “El Nino” Ruiz, 21-4 (13), out of Tijuana, MEX, at 1:57 of the third round of a scheduled ten. The referee was Charlie Fitch. Former WBA Super Featherweight champion now No. 6 by the WBC Jason “El Canito” Sosa, 22-3-4 (15), of Camden, NJ, in a brawl from bell to bell each scoring knockdowns defeated Moises “Gatti” Delgadillo, 18-19-2 (9), out of Guadalajara, MEX, over 10 rounds. In the opening round Sosa kept coming forward but received a cut on the bridge of his nose halfway thru the round. This has been a real slugfest on both parts. In the second round Sosa landed a double left hook to the body and Delgadillo countering a left hook to the body. This could have been fought in a phone booth. No one tried slipping a punch. A left hook from Delgadillo had Sosa wobbling and down. Referee Gary Rosato gave him the 8 count as the bell sounded. In the third round a right hand to the head of Sosa rocked him. Sosa came right back slipping a punch landing a left hook causing swelling under the left eye of Delgadillo. They matched punch for punch throughout the entire three rounds. In the fourth round Sosa starts out moving around becoming the counter puncher until he got hit causing him to return to the slugfest. There have been few jabs. The fans are loving it. Sosa finally back Delgadillo up with a flurry of punches. One of the rare clinches for the referee seconds before the bell sounded. You can throw out the record of Delgadillo in this one. In the fifth round Sosa starts out with a left hook followed by a double jab to the haw of Delgadillo. Sosa lands a lead right to the chin of Delgadillo. They exchanged left hooks to the head. Delgadillo was warned for a low left hook. In the sixth round Delgadillo landed a 4-punch combination to the body and head of Sosa. There have been few misses in this one. Sosa backed up Delgadillo with a good body attack. In the seventh round both landed right’s to the head. This has been a throwback fight like back in the day. Sosa landed a right to the chin and a left hook to the body dropping Delgadillo who beat the count at 9. Delgadillo got up and grabbed Sosa still being hurt. Delgadillo was bent over trying to protect from body shots. He had swelling under his right eye. It was a big round for Sosa in this one. In the eighth round these two warriors went right back at it. A right uppercut from Sosa to the body hurt Delgadillo but he came right back. When Sosa landed a lead right he got countered by a Delgadillo left hook time and again. The exchanged punches from bell to bell. In the ninth round with both throwing punches a Sosa right to the chin rocked Delgadillo who comes right back. Delgadillo’s face us a swelling mess but he knows no quitting coming back with a w-punch combo to the body and head. In the tenth and final round both continue throwing and landing punches. Sosa landed a right to the side of the neck of Delgadillo. Sosa landed a hard right at the bell. Both fighters hugged and smiled at each other in respect. What a fight! Scores were Don Ackerman 96-92 and with Tom Schreck and John McKaie having it 97-91 with this writer having it 95-93. Three time Olympian, 2016 Olympic Gold and Pan Am Gold Medalist with over 400 amateur fights Super Featherweight Robson “Nino” Conceicao, 11-0 (5), of Salvador, BRZ, scored a shutout over Hector “El Estudiante” Ambriz, 12-9-2 (6), out of Ensenada, MEX, over 8 rounds. In the first round Conceicao the aggressor landed a right to the head and left hook to the body of Ambriz. Conceicao landed a pair of rights to the body of Ambriz. Ambriz kept moving as Conceicao chased and landed well with his right hand. In the second round an overhand right from Conceicao landed on the side of the head of Ambriz who complained of a rabbit punch for the third time in the fight. Ambriz landed a counter combination to the head of Conceicao. A Conceicao jab knocked back the head of Ambriz who was backing up. In the third round Conceicao continues looking for a knockout with Ambriz moving at all times. Conceicano landed a lead right uppercut to the chin of Ambriz. Conceicano landed a right to the head but the left hook to the body was a crushing blow. Ambriz comes back with much lighter punches evading the big blow. In the fourth round with the corner of Conceicano urging him to knockout his opponent he came out throwing bombs. Ambriz was not an easy target with his movement making Conceicano miss three punches while countering back with a combo of his own. It was the best round for Ambriz whether he won it or not. In the fifth round a right from Conceicano to the chin rocked Ambriz. A wide right from Conceicano to the head knocked Ambriz off balance. In the sixth round Ambriz came out with swelling around his right eye from many rights from Conceicano. Conceicano landed a solid left hook to the chin of Ambriz. Ambriz comes back with jabs but doesn’t have the power to compete with Conceicano but a good heart. Between rounds Conceicano was standing. In the seventh round Conceicano landed a rare body punch from a left hook. Ambriz right eye swelling showed a small cut. It was a close round with Ambriz not winning one but always in there. Conceicano has been pressing for a knockout that is not coming. In the eighth and final round Ambriz missed a combination with Conceicano landed a right to the head. All his punches are arm punches as Ambriz is determined to go the distance. Both landed right hands to the chin. Ambriz landed four punches with Conceicano covering up. Conceicano won every round but just a win not an impressive one. Referee Benjy Esteves, Jr. did his usual fine job. Scores were 80-72 as was this writer’s. Super Lightweight southpaw Fazlidden Gaibnazarov, 8-0 (3), of UZB out of L.A., CA, stopped Dominican Ricardo Garcia, 14-6-1 (9), out of Reading, PA, who retired at the end of four rounds of an 8. Referee was Benjy Esteves, Jr.
Making his debut 2016 Olympian Middleweight Vikas Krishan, 1-0 (1), out of Hisar, India, stopped Steven “Iron Man” Andrade, 3-4 (2), out of Cartersville, PA , at 2:31 of the second round, of a 4. Referee was Benjy Esteves Jr.
Ring Announcer was Lupe Contreras. 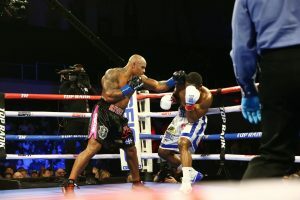 The post Top Rank Boxing Results: Rivas Stops Jennings in 12th appeared first on BoxingInsider.com.